On this date in 1620, Sidonia von Borcke was beheaded and then immolated in Stettin (Szczecin) — one of the most notorious witch executions in German history. 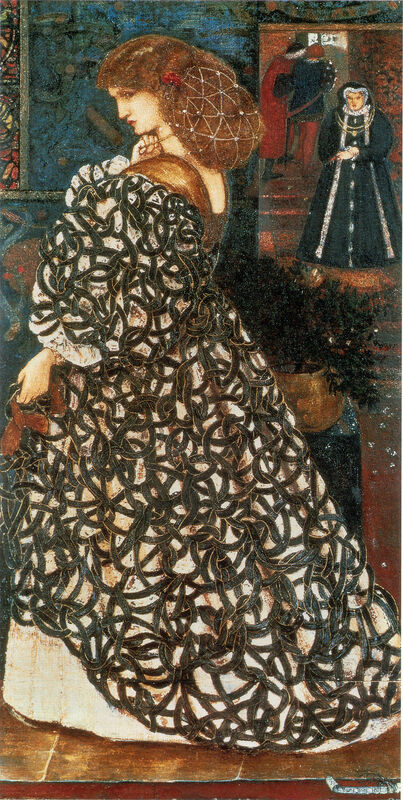 The Pre-Raphaelites quite fancied the Sidonia story: this is Edward Burne-Jones‘s 1860 watercolor Sidonia von Bork. This Pomeranian noblewoman (English Wikipedia entry | German), aging and penniless, resided from 1604 in a Lutheran Stift, a secular convent for unmarried ladies. There she busied herself and the courts of the Holy Roman Empire with numerous lawsuits against the convent’s prioresses, other women in the cloister, and inheritance disputes with members of her family. 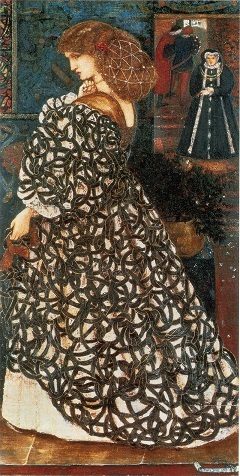 According to Gerda Riedl’s “‘Alles von rechts wegen!’ Frühneuzeitliches Hexenprozeß-(un-)wesen am Beispiel des Falles der Sidonia von Borcke” in Hexen: Historische Faktizität und fiktive Bildlichkeit, the frayed nerves around Sidonia finally snapped at a church service where she and the sub-prioress got into an altercation and were both arrested. It was July of 1619. Sidonia von Borcke was a cranky 71-year-old spinster with a knack for making enemies. And then the sub-prioress accused her of witchcraft. The ordeals of the next year occupy over a thousand pages in the archives. A wandering fortune-teller named Wolde Albrechts was slated with channeling the infernal powers for Sidonia: when put to torture, that poor creature soon admitted all, complete with the obliging accusation of Sidonia. Her ashes were barely cold when Sidonia passed into folklore and thence to legend, eventually to be seized and considerably embellished by Gothic poets in the 18th century. Her countryman Wilhelm Meinhold‘s Sidonia von Bork, die Klosterhexe situates her as a beautiful young woman balked of her dynastic marriages who goes on a midlife jag as a picaresque outlaw before repairing in her dotage to the abbey heavy with grievances. English translations of it were wildly popular, including one rendered by Oscar Wilde‘s mum. * Succession started passing to the late duke’s brothers, and the Harry Potter-esque House of Griffin which had ruled Pomerania back to the 12th century was done by 1637. Their destruction juxtaposed to Sidonia’s own would help cement the latter’s immortality.